There’s an old tune that hums along “you make me feel so young, you make me feel like spring has sprung”. Those words could be applied to the emerging blossoms on Cape Cod after a winter of seemingly never ending snow. The crocuses have made their arrival, daffodils are popping up, and bare branches are showing signs of life with the small buds that will turn into verdant, fragrant leaves. While many of the flowers can be seen walking along the Cape, there are some places that are better to spot them than others, such as local gardens (Heritage Museums and Gardens of Sandwich, Spohr Gardens in Falmouth), or during some of the flower festivals on the Cape. Spohr Gardens in Falmouth will be holding a Daffodil Day on April 25th from 10am to 4pm. Admission is free. Not only will there be plenty of daffodils, but there will also be soil testing, face painting, a ventriloquist, and more. From Friday, May 1 to Sunday, May 3, Brewster will be holding their annual Brewster in Bloom festival, which heralds the return of spring with a parade, crafts, a 5K, and more. So celebrate the arrival of Spring on Cape Cod, either at a local garden, a festival, or on your own, wandering throughout your favorite town. 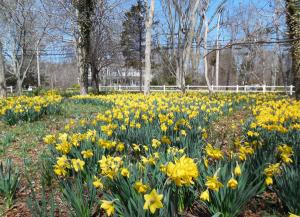 Brewster is host to an annual daffodil celebration for a reason. Here along Route 6A in Brewster. Photo by Maggie Kulbokas.